It is always so nice to find someone who enjoys their work. It can be a friendly bank teller or a personable business contact. The fact that they enjoy their work makes the interaction pleasant but it also seems to a good indicator that they take pride in their work. Recently we’ve had the pleasure of having such a guy around GSC. Lester Buildings crew leader, Greg Leschisin keeps his crew on task with a smile on his face. In 1977 Greg Leschisin graduated high school and started his career constructing post frame buildings with Lester Buildings and has been doing it ever since. 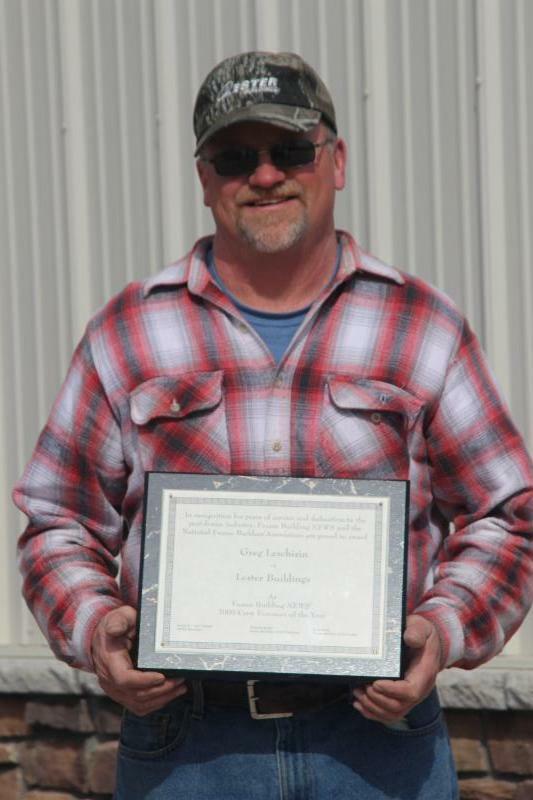 He has been leading crews since 1986 and was awarded Crew Foreman of the Year in 2005 by the National Post-Frame Builders Association. He was first awarded Crew Leader of the Month and then competed against other crew leaders from across the country from various manufacturers. We are pleased to have Greg’s 40 years of expertise here at GSC. Over his years putting up post frame buildings he has seen it all. A creative building in Red Wing, a barn home in Scandia, and an impressive barn in Elko are standouts. The job has taken a toll on Greg’s body. He has had a knee replaced, a shoulder replaced, and has carpal tunnel in his hands. His aches and pains forced him to give up basketball. Although he still holds the single-game scoring record at Clayton High School with 47 points. Greg and his wife were high school sweethearts and still reside in Clayton, Wisconsin. When he isn’t working he enjoys bow hunting and is quite a gardener. He and his wife also enjoy being grandparents to their three (soon to be four) grandchildren. Greg is eager to retire but jokes that his wife wants him to keep working. Quality construction is of the utmost importance to us and having someone with the same values on-sight is a tremendous asset. Greg is a hard worker and keeps his guys safe and on task. He is also a lot of fun to have around. Well done Greg, we’re glad to have you here!